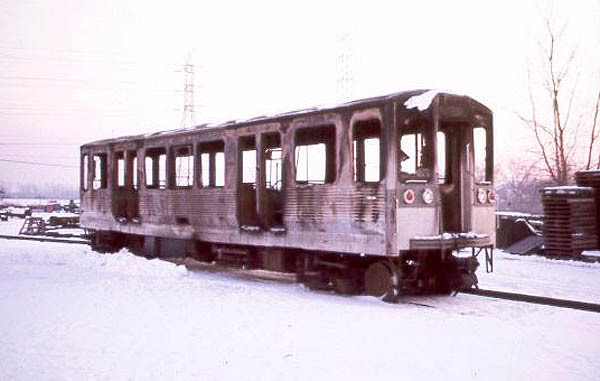 #2211-12 in service 9/28/69; moved to the long-term hold list and stored in Rosemont yard by 6/5/2013; transferred from Rosemont Yard to Skokie Shops yard overnight on 7/23-24/13; scrapped by Belson Steel Center Scrap; car #2211 sent on 8/9/2013, car #2212 sent on 8/8/2013. #2243-44 in service 12/20/69; moved from active service to the long-term hold list by 6/5/2013; bought by the Illinois Railway Museum for preservation 6/7/13; sent to Skokie Shops yard 6/14/13; car #2243 was delivered to IRM on 7/10/13, car #2244 was delivered on 7/11/13 (pictures on the IRM blog) "http://www2.irm.org/blogs/archives/1522-2200s-Arrive.html"
#2257-58 in service unknown; removed from service after #2258 had a trolley block fire on the Congress Line between California and Western on 1/15/97; car #2257 initially stored at Skokie Shops, then assigned to the CTA Maintenance Training Facility (initially at Hawthorne, then later at IIT), then moved to Skokie Shops on an interim basis on 12/9/04, then moved to Linden Shops on 2/18/05, car scrapped on 4/21/2011; car #2258 removed from service due to severe damage resulting from the 1/15/97 fire, laid up at Desplaines Yard when scouts from Universal Studios saw it on a scouting trip for Mercury Rising, body sold by CTA to studio on 6/25/97 and shipped to Hollywood where it was used in the filming for Mercury Rising, later modified with red and blue stripes to mimic a Los Angles Red Line train for another film, subsequently used in Spiderman II and other features. #2289-90 in service unknown; unit damaged in loop accident on 2/4/77; authorized by CTA for retirement on 12/21/82; held in storage as on 9/6/83; scrapped on 7/22/86 at Pielet Brothers Scrap In McCook, Illinois (pictures of damage to #2289) "http://www.chicago-l.org/trains/gallery/images/2200/cta2289.jpg" (picture and audio recording of accident at Lake/Wabash in 1977) "http://www.chicagonewsreport.com/2012/02/audio-remembering-feb-4-1977-loop-cta.html" (additional pictures and info at Chicago-l.org)"http://www.chicago-l.org/mishaps/loop.html"
#2315-16 in service unknown; Unit involved in accident at Chicago/Milwaukee in 11/77; with car #2315 suffering shattered passenger side motorcab windshield and a portion of the windshield frame was damaged, unit transferred to Skokie Shops for repairs, car #2315 damaged in fire at Skokie Shops yard that started on S-606 on 11/26/77; authorized by CTA for retirement on 12/21/82; held in storage as on 9/6/83; scrapped on 7/23/86 by Pielet Brothers Scrap in McCook, Illinois; car #2316 was renumbered #2352 and paired with #2351 (originally #2307) after mate was authorized for retirement side #2315 (picture of burnt out #2315) "http://www.chicago-l.org/trains/gallery/images/2200/cta2315.jpg"
#2341-42 in service unknown; Involved in derailment At Cicero/Douglas on 9/24/79; car #2341 converted to a training car scrapped on 6/27/01; car #2342 suffered damage from Cicero/Douglas accident; authorized by CTA for retirement on 12/21/82; held in storage as of 9/6/83; scrapped on 7/22/86 at Pielet Brothers Scrap in McCook, Illinois (pictures of damage to #2342) "http://www.chicago-l.org/trains/gallery/images/2200/cta2342.jpg" (pictures of accident at Cicero/Douglas)"http://www.chicago-l.org/mishaps/cicero.gif"
#2347-48 in service 11/13/70; stored in 54th Yard 8/12; back in service 9/12; stored in Rosemont yard since early 5/13; sent to Skokie Shops 8/1/13; it went up for bid auction on 12/18/13 at Rick Levin Auctions and one of the cars was sold to a Jungle Jim's International Market in Fairfield, Ohio. (Press Release To Jungle Jim's) Rumor has it that the second car was sold to Google for their Chicago offices. 7/31/13 was the final date in revenue service on the Blue line. 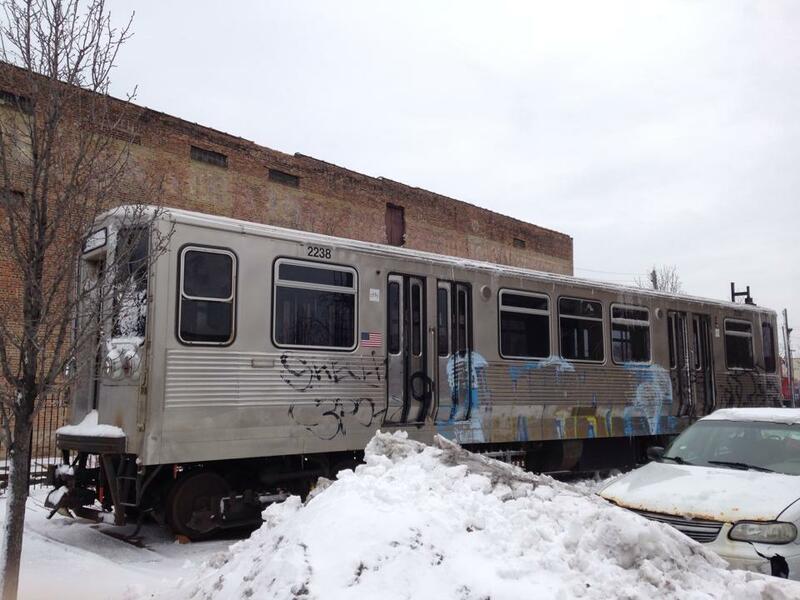 On 8/8/13, a special farewell trip was run by the CTA, Cars stored in Rosemont yard will remain there until enough extra #2600's are transferred over to replace them. Here is a lifetime assignment sheet for the #2200's so far. I can remember in my long ago youth seeing these cars being tested in the median of the Dan Ryan Expwy prior to opening of the Lake-Dan Ryan rapid transit. My how time has flown. Those must be official roster dates, but based on that, darn few were available upon the opening of the Dan Ryan on September 28, 1969. 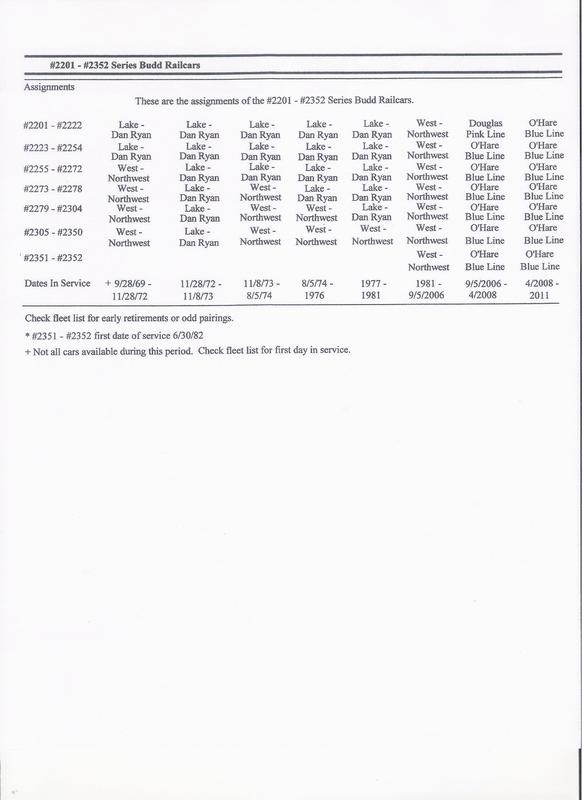 I seem to remember that the Lake-Dan Ryan had a full fleet when it started, but mostly 2000s. However, I needed to refresh my recollection by going to CERA 115, page 115, which said that 54 2200s were on the Lake-Dan Ryan. If this list is correct, that indicates that it was running short into January. In that the Jefferson Park extension opened on Feb. 1, 1970, it must have been short, too. However, CERA indicates that the reason it got 96 cars was that 40 2000s were shifted from the WNW to LDR. Apparently some got shifted back 2 years later. Having ridden the LDR starting about 1970, I have to concur with Gene King. has anyone seen the 2200's in a lake dan ryan consist with the 2600's on the lake dan ryan? The only thing I saw were 2200s with 2000s (initially that didn't happen, and it was somewhat surprising to see stainless cars with green ones). By the time I got back, 2600s were mixed with 2400s, but the 2200s were all on the WNW. However, I am not in a position to say what happened basically between 1986 and 1994. When the 2600s were put on the Lake Dan Ryan, the remaining 2200s there were moved to the West Northwest Route. Later the 2000s were moved to Howard for a time and finally the Green Line. The 2000s were retired when the Green was closed for rehab. The 2000s were retired when the Green was closed for rehab. Chicago-L.org has them all scrapped or earlier disposed of by early 1994 (I thought the official retirement date was 1993), with the arrival of the 3200s, in that about 100 3200s were required for the Orange Line, and the other 156 or so to retire the 2000s. But then, Chicago-L.org has the Green Line closing in 1994, so I guess that the cause and effect were not as clear as I thought, but it still looks like the impetus was the arrival of the latter portion of the 3200s. I believe you are correct. I just used the time frame of the Green Line closure as a benchmark, as they were being used there up to their demise and I remember them being there in their final days. If I recall correctly, the Green Line closed very early in 1994, January I believe because when I started the spring semester (which starts in January) at IIT in 1994 the Green Line was gone and I was using 23 and that period's 38 to get to class. Perhaps that's why you remember the 2000s retirement as 1993 Busjack along with Trainman and I remember them being in use up to the closing of the line for rehab. 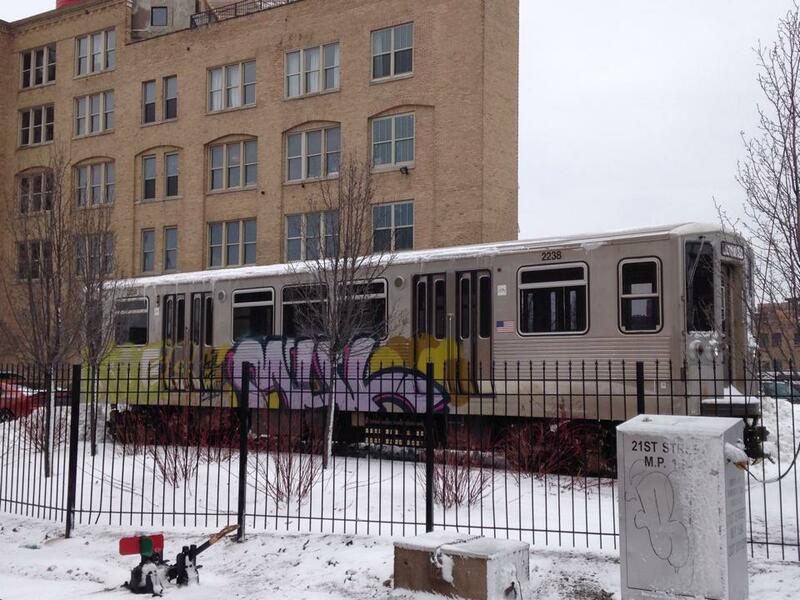 Were the 2200's ever coupled with the 6000's on the WNW line? No. According to CERA, the cars were not electrically compatible, had different control systems, and a different number of pins in the electrical coupler (to assure that they weren't connected). They said you could push one with the other in an emergency, but you couldn't operate them that way. Your all correct, the last #2000 (#2067-68) was retired 12/28/93 with the green line being cut from the rest of the system on 1/9/94. Of course this doesn't count 1892-1992 (former #2007-08) painted to celebrate the Centennial of the South Side "L". These cars still exist at Skokie Shops, but their paint job is getting beat up by the weather. Your all correct, the last #2000 (#2179-80) was retired 12/21/93 with the green line being cut from the rest of the system on 1/9/94. Of course this doesn't count 1892-1992 (former #2007-08) painted to celebrate the Centennial of the South Side "L". These cars still exist at Skokie Shops, but their paint job is getting beat up by the weather. Of course, that means that the other 17X were retired before then. Just like it appears that the first 54 2200s weren't all there on the first day of Dan Ryan service (IIRC, it started with 6 car trains and then went to 8, so maybe they didn't need all the cars at once), 170 some 2000s didn't drop from the roster on the day the Green Line closed. OK. Thanks for the information. I was just thinking ahead as to how a museum like IRM or FRTM might be able to operate the 2200's in the future assuming they get a pair. 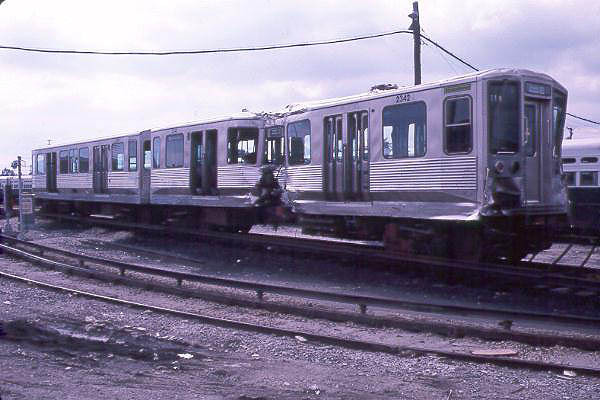 Since the 2200's never had overhead wires, I thought they might be able to couple them to an older CTA car that had them. Stay tuned, I have another list for #2000's just like the #2200's one I put up. I'll see if I can put it up. It's a little different the retirement dates are actual dates of scrapping, but most of those cars were running about a week to a month earlier. I probably should have mentioned in response to the indicated BusHunter and ctafan630 posts that there are the two at IRM, 2153 and 2154. Those have been more known as vandalism targets, and as ctafan630 indicates, probably can't be operated in fan service. The Matchbox trolley is more fun, anyway. I've only lived in Chicago for about a year and a half now, but the CTA rail system fascinates me. 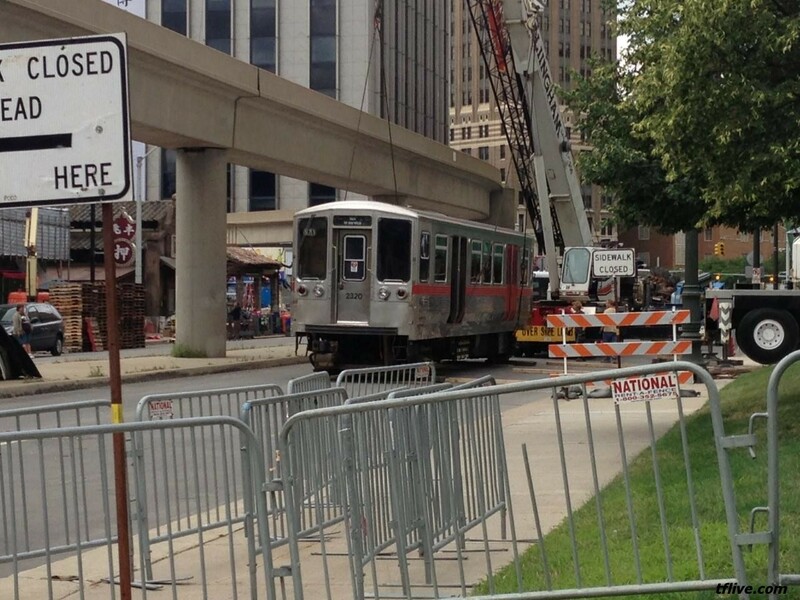 I grew up in Cleveland, where the closest thing we had available was the RTA Rapid Transit. Anyways, living here now, it's a shame to see the 2200 series go. I find them to be far less dated-looking than the more recent cars. Aspect lights inside the cab, stainless steel inside and out, and no godawful-ugly wood paneling! I know they aren't accessible and probably fail quite a lot, but I like those old things. Noisy in the subways, but I find myself deliberately waiting in the middle of the Blue Line platform so I'll be on a 2200. ... Anyways, living here now, it's a shame to see the 2200 series go. I find them to be far less dated-looking than the more recent cars. Aspect lights inside the cab, stainless steel inside and out, and no godawful-ugly wood paneling! I know they aren't accessible and probably fail quite a lot, but I like those old things. Noisy in the subways, but I find myself deliberately waiting in the middle of the Blue Line platform so I'll be on a 2200. 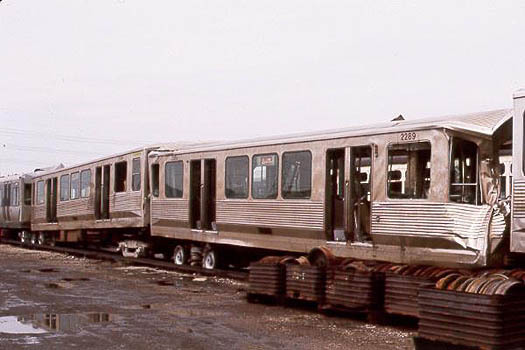 If only the bodies counted, they probably are in as good of shape as they were in 1969, considering that they were the first Chicago cars made of stainless steel. However, problems undoubtedly have to do with the undercar electrical equipment, as well as the ADA accessibility issue. As far as the wood paneling inside the later cars, the decor is based on the New Looks in the 1970s, and, based on Huberman's presentations on how the decors could have been updated, I am surprised that subsequent brass went along with that 38 year old look, only altered by replacing the vinyl inserts with the more vandal-proof fabric ones. But to go full circle, you should have seen the 2200s when they still had black leather upholstered seats. That was impressive. Ive been to Cleveland And I absolutely enjoy riding the Red Line. I love those Tokyu Japanese cars. It has an interurban feel to it with the overhead catenary and light rail running side by side. Pretty awesome if you ask me! Last time I was home, it was kind of amusing to see a single-car Red Line roll up. After coming from Chicago where an off-peak train is a 4-car consist, seeing a peak-period train run with 1 car and not be crowded? Weird. I like the Breda LRT cars on the Blue/Green/Waterfront line myself. I was 14 when the Waterfront Line opened in mid-1996 - It was a HUUUUUGE deal at the time. I always thought those LRT cars were where it's at, even though the cars are 30 years old, they don't really show their age to me. The Red Line cars look they were built 3000 years ago to me! Looks like the retirement of #2200's has begun. Per the 6/12/11 assignment list #2291-92, #2325-26, and #2329-30 have been authorized for retirement. #2283-84 and #2345-46 are now on long term hold. With the #5000's coming in shortly those 4 cars are most likely never going to be returned to service. I edited my list (first post under this topic) to reflect the new changes as well as the old ones. There are now 132 cars left for those wondering what's left for #2200's. I added a lifetime assignment list to the first post in this thread, so we have a better idea where the cars were at a given period. The 2200s have probably been around since 1970(or 1969)when they were on the then Lake-Dan Ryan line. They were built by the Budd company. 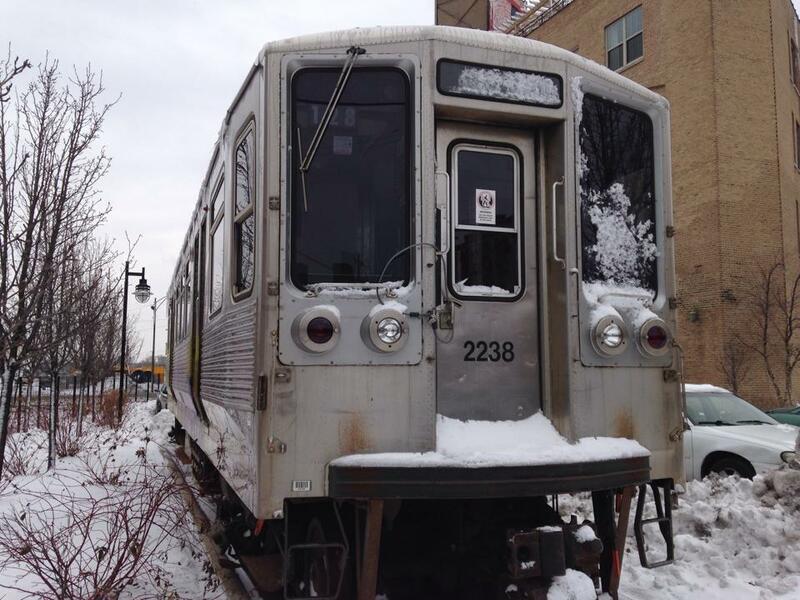 How do you like living in Chicago and the Chicago Transit Authority? 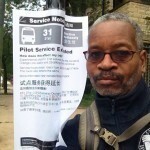 I've lived here all my life(since I was born here in 1961)and, as a little boy, I rode the old CTA buses(especially the propane buses known them as LP-gas buses)anyways, if you want CTA badges, be sure to go to Ebay(ebay.com)and check them out! To do that, once you're in Ebay's website, punch "CTA Badges" in the website search engine! BTW, did they have propane transit buses in Cleveland? The decline of the 2200s seems to be showing up. I have noticed an increased number of consists the past few weeks with 6 2600s and 2 2200s instead of what was 4 and 4. Also quite a few complete 8 car sets of 2600s too. I have not noticed a 2900 under 2961 as of yet.